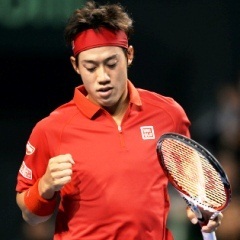 Indian Wells - Japan's world number five Kei Nishikori's run at Indian Wells ended on Wednesday with a 6-4, 7-6 (7/2) loss in the fourth round to Spain's Feliciano Lopez. It is the first time this year, Nishikori has failed to reach at least the quarter-finals of an ATP Tour tournament. Lopez moves through to the quarter-finals where he will face Britain's Andy Murray who beat France's Adrian Mannarino 6-3, 6-3. Lopez blasted 12 aces, won 82 percent of his first serve points and broke Nishikori twice in the one hour, 35 minute match. Nishikori was playing his second straight Spaniard after a hard fought 6-7 (6/8), 6-1, 6-4 win over Fernando Verdasco in the previous round. Japan's US Open runner-up said the turning point was late in the second set. "I really had one bad game at 5-4. That's all that matters in today's match," Nishikori said. "Until then I was playing better. I was, you know, dominating the strokes. "He was hitting good serves, but I had all the chances." Lopez and Nishikori have now met six times with both winning three. Lopez says he played some of his best tennis in the tournament Wednesday. "The match was very close and finally I found a way to play better than him," said Lopez. "I was mixing it up. I was playing great from the baseline and I was hitting great for the first time in Indian Wells. I am pleased to be in the quarters."